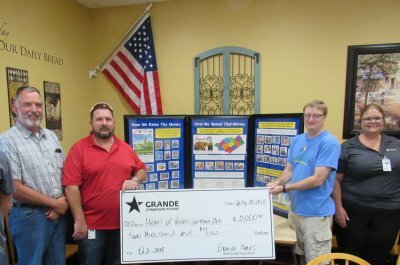 The Heart of Texas Sertoma Club recently received a grant from the Grande employees through their Grande Cares program. 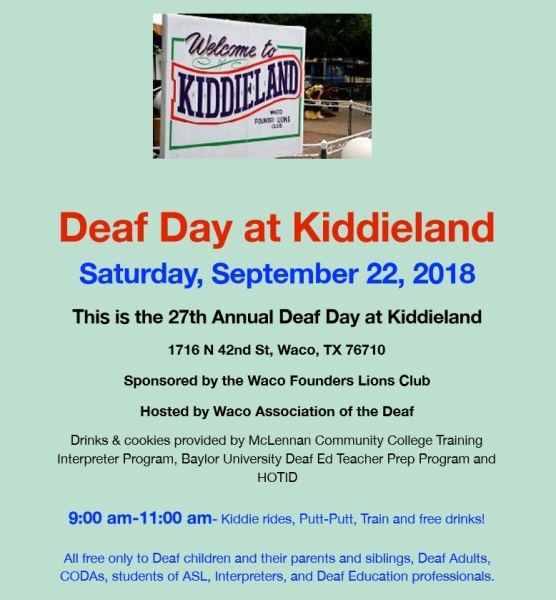 What a blessing it is to receive a grant from this wonderful organization. 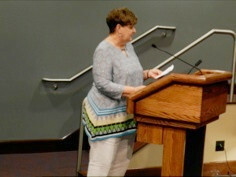 It allows Sertoma to provide at least 4 hearing aids this coming year. 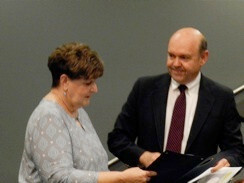 Annually, Sertoma provides 10-15 hearing aids plus audiometers and otoscopes to Region 12 schools. Pictured L-R - Marty Lee, John Smith, Sertoma President Alec Ylitalo, and Julia Morris. 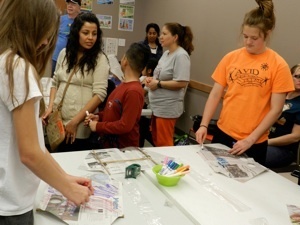 Sertomans Pete & Deena Moffatt, Currie & Rosalyn Bishop, John & Sandra Westmoreland, George Taggert, and Kent Holguin taught over 50 children and their families how to make a simple sled kite at the downtown library kite workshop last Tuesday. 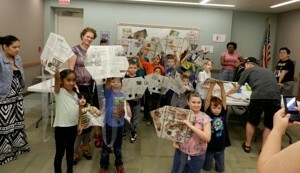 Everyone had a lot of fun as Pete Moffatt guided them through the process with the other Sertomans' help. •A bin-bag at least 800mm x 450mm (2'8" x 1'6"). Cut the bin-bag to the shape in the drawing. Keeping the plastic flat, use sellotape to stick the two sticks to it. Reinforce both wing tips with sellotape. For the tail, make a loop of polythene about 1.8m (6') long and 35mm (1½") wide from the left-over material from the bin-bag, and stick each end to the kite. The kite will fly without a tail, but will fly better with one. 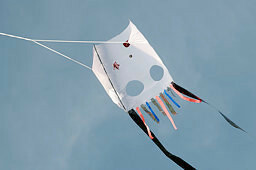 Cutting two holes towards the rear edge of the kite will help it fly in stronger winds. To attach the bridle, make a hole at each 'wing-tip' and tie a piece of thin string about 2400mm (7'10") long to each hole. At the middle of the bridle tie a small loop in the string to attach the line. Tie on the line, which for a kite of this size only needs to be slightly thicker than button thread, and you are ready to go. If you want to make a bigger kite, just multiply all the dimensions by two (or three, or four...) but remember that the larger you go, the stronger you will need to make it. You could even see how small a kite you could make. To launch the kite you will need two people. Let out about 15m (50') of line and with the second person holding the kite spread, let the wind take it up. With practice you should be able to launch it with only one person. to a Flash animation of how to make the kite. 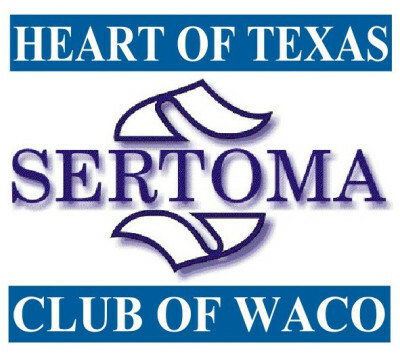 Sertoma President Sandra Westmoreland accepted the proclamation from Mayor Malcolm Duncan on behalf of the Heart of Texas Sertoma Club, along with Sertomans John Westmoreland, George Taggert and Rosalyn Bishop in attendance. 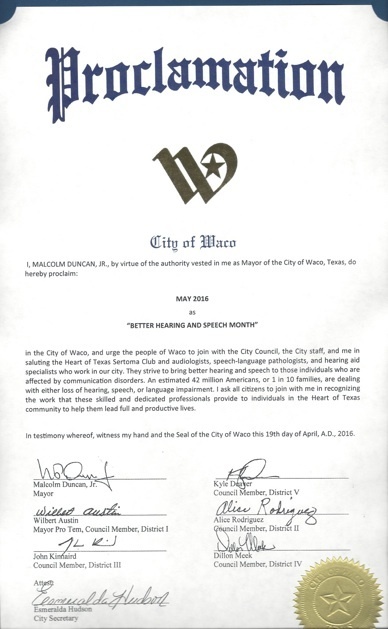 ..."MAY IS BETTER SPEECH & HEARING MONTH"! The Service To Mankind Award is given to deserving individuals who have gone above and beyond in their lives of service to others. 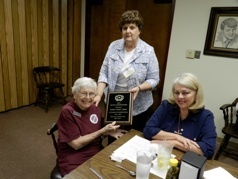 her involvement in jail ministry, Mission Waco, Friends For Life, distributing Bibles for Gideons, and calling on nursing home residents and shut-ins for her church. At 90 years old Chick is no longer able to drive and has difficulty walking, but her daughter, Nancy Rood, is still taking her to call on shut-ins as she continues her life of service to others. 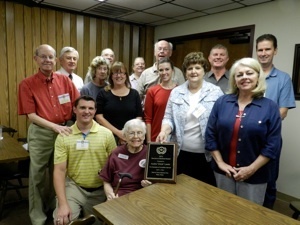 Pictured L-R - Front row Sertoman Keith Reed, Recipient Audra “Chick” Lewis, Sertoman Sandra Westmoreland, Chick’s daughter Nancy Rood. Back row - Sertomans Harry Tichavsky, George Taggert, Jana Picard, Currie Bishop.